232 being the number of months since I first laid eyes on her. I don’t carry these numbers around in my head, it did take a bit of figuring and trying to remember the leap years was beast. The thing is, numbers only carry the importance we give them. And when we are talking about moments we are together with someone we care for, each of those matter. Every week, we have roughly 150 poets crash the doors of the pub. Our largest was in the 170s. And while all of that is grand, those numbers really don’t matter all that much. If we ran 100 poets, I would be fine. If we ran 50, it would be alright by me. In the end, it’s not the numbers but the people they represent. Many of you I have read since our opening. Some of you I have enjoyed meeting along the way. If this is your first week, welcome…I will be over to meet you soon. Smiles. I definitely don’t catch everyone when they leave, but I try, because each one of you that has stopped in…for one week or for all 50…you are a voice…that has joined other voices…and touched the hearts, minds or poems of another. And together, we are a force to be reckoned with….So let’s get this poetic party started! Click the Mr. Linky button below. Here you are provided a form to enter your name, as well as the post address. Enter them both & click submit…you’re in! Mr. Linky stores the addresses of all Poets who are joining in. Here you can visit and share any poems you choose. We are about community, and sharing the good work of the poets who share their hearts and minds with us. Tweet, share, like and love. We grow when we engage. Talk to the poets, comment, share, foster relationships along with stronger pens. The talent that so freely gives of itself here, each and every week, is amazing. There are so many to learn from, so many you could help. 50 weeks of poetry. Congrats to all of you on this. Breaking it into seconds? Even better. It’s a complex alphabet of brilliance. So happy to have found it. glad to have you here kevin…. What a lovely post! My husband and I too will use any excuse for any anniversary. Thanks as always for hosting this! Here’s my Limerick Airs. Welcome to OpenLinkNight everyone…and hey wait…how did Tash get the top spot…smiles…hope you all are having a great day…lets roll some poetry…. Dverse has become part of my week. Thank your for the consistency. and thank you for your ma’am….be over in a bit…after i manage the rush…smiles. HA! I snuck in there with the big kids today! good afternoon…smiles….hope you did not take too many elbows to get there…smiles..
Got some knuckle-bumps on my haid, but they don’t hurt juss as long as I keep on grinnin! Hey guys, I really screwed up. Posted twice. The first one I posted is last week’s entry–in error. Can you fix (delete? Thanks you. no sweat steve…will get right on it…anything for my peeps! We must have been struck by the same twitchy finger bolt! Numbers do count when it comes to longevity in marriage and any good relationship. So cheers to your marriage, and cheers to dVerse for it’s almost one year marriage! Yay! First, Brian, congrats on the 50 weeks. Secondly, you and Claudia are to be applauded on your incredible energy and generosity of spirit. You really are terrific in your commenting – not only that you make the effort of the visits, but you read and genuinely respond–I think it must be very difficult to keep that spontaneity even with a love of poetry and people. So, thanks must be added in with congrats. k.
I’m going to be slow tonight in reading but will do – having just gotten back from eye doctor–good news – my eyes have not decayed in the way I sometimes fear – temporary bad news– can’t see a thing! k.
Oh, the feeling is so mutual… I have come to love this place/space and all the poets who inhabit it! thank you kelly….it def is mutual…. you as well becky…and you brought some heat to make us melt a bit this week…. yep..it’s not about numbers…never was…never will be…. if the numbers went down i may would manage to read everyone..smiles….happy OLN everyone…let’s get that party started…see you out on the trail..
Nearly a year here – the times keep changing. All around us things affect us, wind and weather, seasons shifting, news and events – in the UK the Jubilee and the Olympics, in the US the election and the constant campaign commercials. Our own lives winding in & out, the opening of new neighborhood shops, the end of an era when a building goes up, or a landmark we loved comes down. We are poets, we take notice, and what we are and the era in which we live along with our contemporaries and peers mark our time here. 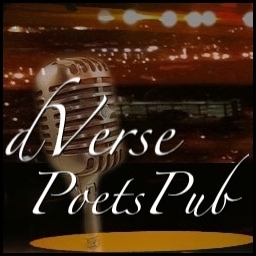 It’s such a joy to read and share with the poets who link here. They expand our horizons, inform us of their events and make them ours. It is a unique love story. Thank you Brian and Claudia for your friendship, your dedication and your sacrifices. It is much appreciated by all of us. and i am blessed in knowing you gay…smiles. Brother, you are a man after my own heart. I tell Ms Anita Happy Anniversary every Friday as that’s the day of the week we married. This Friday is 500 weeks! Thanks for the great intro- see you online and in the back on a cot sleeping it off. And we’re still going strong. Thank you for opening this joint and asking me to be part of it in some small way. I hope I left things neat for you behind the mahogany, boss! Joy/Hedge sets a very high standard I try to maintain. Ditto on Grace’s remark. I’m also proud to say I was here at your grand opening too 🙂 50 weeks already, doesn’t seem possible, does it! But, I too have met some amazing poets since then too. No, it isn’t about numbers, to lovers of them, it’s all about words, writing them, reading them. 🙂 Nice post Brian. Wondering what you and Claudia have up your sleeves for the 52nd! Brian, thanks for hosting and giving your incredible energy to all of us here at the pub. You are amazing with the numbers with the wife–my husband has to remind me how many *years* it’s been, frequently, as my mind and numbers are completely incompatible. I barely made it this week–thought I was going to have to post an old one, but got a few words agitating to come out late last night, so welcome to my moon. I have to attend to some boring reality now, but will be back later for the finer things in life, always on tap here on Tuesday nights. Thanks for hosting tonight! A grand night to visit the pub, see you inside! a new poem by me and wow! all those links posted in less than half an hour – it’s happy reading hour! Oh gosh its Tuesday? I lost a day somewhere. Glad I saw Claudia’s reminder of FB or would have missed… again. Happy 50 everybody. How lovely, we appreciate all you do for the poets. This is a great place to share, read and grow as an individual and as a community. Two or three years ago when I started on twitter, I was a hopeful (at best) poet, not believing in myself. Places like this have changed that. So thanks for all you guys do and caring to boot. oh congrats Brian!!! that’s wonderful. i’m thankful for all of this poetry in my life – thank you poets! Congrats on the anniv. That’s a really cool thing, going by the months and all, you always come up with neat things like that. Really good intro, love the bit on the numbers, totally agree. Hopefully I can get into the reading today and not have to take three days this week, but we’ll see. Cheers. Brian…what a sweet introduction… Glad to be here. Summer is bringing some energy to these bones, and I am going to try to get around the circuit. I have been in a poetic slump for the past 2-3 months…nothing has kick started me. Sitting outside this morning, I got the kickstart. But it’s slight…but it’s moving in the right direction! What an awesome post, Brian. Tara is lucky to have you, and so are we. Thanks for all your hard work counting seconds and making them count. thank you shawna…and thank you….what a delicious write you brought tonight…. 50 weeks. I think I have missed one, darn it. I love OLN and dVerse and all of you who bust your keyboards and personal schedules to tend bar. Thanks so much. I linked some vignettes that I wrote yesterday. My muse is being picky again so nothing brand new. Keep smiling. yay…hey you always have your place in our history…you did the very first OLN graphic…smiles…always good to see you! Happy 50th! The concept of the bar and all the collaborators is brilliant. I always find it open and friendly–the first step to encouraging new poets–and a good step to not over-burdening any of you. In a short while I have come to look forward to each of your voices. I am going to post the poem you read this morning, Brian. I love Tuesdays! what happened to my V….sheesh….probably taxes…. Here I am … I wrote about a ridiculous new ring I got for my 10-year work anniversary … a much bigger stone than it seemed to be in the catalog picture. Smiles. And happy anniversary to you and your wife, Brian. Adding my voice this week! Happy Anniversary! And Happy 50 to Dverse! Well said Brian! Looking forward to the 1 year mark and so glad I happened to bump into yourself and Natasha on Twitter and find the pub. This would be the biggest part of my poetic life, so thanks everyone for all the comments and advice. Rest assured I’m sharing it far and wide! I’m late to the party as usual, but I’ll be over to clink your glass and wish you good cheer in a little while! woot…checking back in…and i am good through rose…we are about 50 pieces away from finishing a darth vacer puzzle as a fam, so i am heading back to do the deed….goos tuff tonight everyone…. Lots of good stuff out there–got the chores done and some reading but the heat (103 today) has given me a splitting headache–will be back tomorrow to finish the rounds–thanks to everyone for sharing with us tonight. sleep well hedge and hope your headache is better in the morning..
oh my…hope you feel better….supposed to turn really hot here the next couple days…over 100 the rest of the week i think…. Phew! I’m always the last to the party. Oh well… I’m diving in! Not obsessed with numbers eh? You had me getting out my calculator! Het congrats! I’ve been erratic in my participation, but tonight I have a “Trade” to share. Will try and read a few, on vacation so limited time, computer time. Am going to write maybe four poems for Summer, my favorite places, over next month. Thanks, always! nice…so where are you on vacation? Hi Brian! Wyoming….sunny and hot like everywhere right now in states. hmmm nice…vacation sound good…have a great time!! nice…glad you are here…welcome to dverse…. As a new kid on this block, i can tell you are making me a more motivated, more dedicated and better poet. Just knowing the group I get to share my lines with, knowing some will read them, some will point out things I am doing that I am not even aware of, makes this journey more rewarding…and of course, I get to read so many great poems all in one place, every week. you really do provide us with a great gift. I greatly appreciate it. you are not late at all….we are open all day today until midnite tonight…. Enjoyed a few poems today, but had to bring work home, and so was distracted…. will continue more tomorrow! Ciao! Lying on the beach is all very well but how good to get back to poetry!! i hope you are not expecting me to feel bad for you…smiles….ah the beach…. I am so glad to be here…I have two poems. A dark one, and a lighter one. Not sure which I will share. THanks for hosting. So appreciate this community. ANd need it! Happy 50th Week OpenLinkNight! Looking forward to many, many, many more here at the Pub! Just a word to those on blogger who still use word verification–it’s extremely hard on the eyes and is worse now than ever. I often have to retry many times to post a comment–I no longer make more than three attempts. Just sayin. Congrats on the Golden Anniversary! I so agree, hedgewitch. I was going to make a comment about that too I thought it was my age. Speaking of age…I apologise for not visiting more poems this week and not posting my arm. Having some carpal tunnel issues, or maybe arthritis. As they say: (cliche alert) Aging ain’t for sissies!